How would you like for God to bless everything you do? Silly question, isn’t it? Who wouldn’t want God to bless everything they do? But will God do that? Absolutely, but He expects something from us first. In George Orwell’s book, entitled 1984, he describes a world not only bound in deception but also thriving on it. It’s a civilization not unlike our own. In it Orwell spoke of a language called “newspeak” where terms like “bad” were changed to something a bit more pleasant like “ungood.” Our society has adopted a similar language. Only we call it political correctness. For example, a person is no longer deaf he is called aurally challenged, and one who is blind is visually challenged. It all boils down to the same thing. It’s just said in a way that some think is less offensive. Orwell used another term called “Doublethink.” It’s the notion that one can equally embrace two separate belief systems, i.e. that one can believe one way, yet act another way. This sounds familiar, doesn’t it? A lot of us call ourselves Christians yet we live a life devoid of Christianity. I know this may sound a bit bizarre, but many of us “Christians” treat the Bible like it’s a spiritual smorgasbord. We want to pick and choose what we want to believe in the scriptures and, also, do the same when it comes to obeying God’s Word and, then, we still expect God to bless us. The Bible calls this being double-minded. It also calls it being deceived. James spoke of the effects of such an attitude earlier in this chapter. 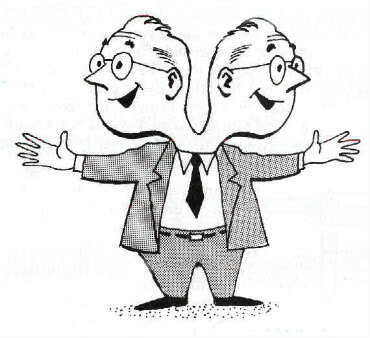 To be double-minded (one who is guilty of doublethink) is to vacillate between two opinions. 2 Chronicles 25 speaks of a double-minded man named Amaziah who was king of Jerusalem. Verse 2 says, “He did what was right in the eyes of the LORD, but not wholeheartedly.” God is searching for sold-out saints in the midst of a society of half-hearted church members. He’s looking for those who are willing to follow Him unconditionally without question or reservations. God is looking for servants who will finish the course and obey Him in all things. Are you an “Amaziah Christian”? Are you double-minded? Do you sort of follow God by sort of obeying Him? In other words, do you do what is right in the eyes of the LORD, but not wholeheartedly? If so, don’t expect God to bless what you do. God never has, and never will, bless disobedience. It’s the one requirement that James said was essential in order for a believer to be blessed in what he does. Let me make something clear before I give the wrong impression. You must understand that I’m not talking about gaining God’s favor through good works. No, I’m not talking about works. I’m talking about fruit. Jesus said, “by their fruit you will recognize them.” (Matthew 7:20) Your level of obedience will reflect the integrity of your fruit—of your willingness to obey God. People will look at you and see the uncompromising relationship you have with our LORD, and they will want what you have. Let’s all repent of being Amaziah Christians, shall we? Let’s get serious about reaching this fallen world for Christ. Then, and only then, will God bless all that we do.